The weakest recovery in modern history has stretched on for 69 months. By 2017, it will be the third-longest recovery without a recession since the Great Depression. By 2018, it will be the second longest. Only during the halcyon economic days of the 1960s have we seen a longer recovery; but that record, too, will be eclipsed sometime in 2019—if we don’t see a recession first. And note that we were growing at well over 3% in the 1960s, not the anemic 2% we have averaged during this recovery and certainly not the positively puny 1.5% we have endured lately. Global growth is slowing down. Given the limited number of arrows left in the Federal Reserve’s monetary policy quiver, the US is going to have a difficult time dealing with the fallout from a recession. Even worse, a number of factors are coming together that will require serious crisis management. Next year, the US national debt will top $20 trillion. The deficit is running close to $500 billion, and the Congressional Budget Office projects that figure to rise. The CBO projects the deficit will rise to over $1 trillion by 2023. 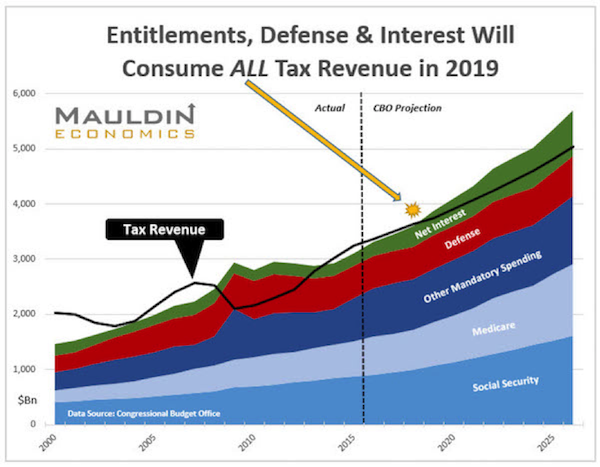 By that point, entitlement spending and net interest will be consuming almost all tax revenues, and we will be borrowing to pay for our defense. By 2019, the deficit is projected to be $738 billion. There are only three ways to reduce that deficit: cut spending, raise taxes, or authorize the Federal Reserve to monetize the debt. At the numbers we are now talking about, getting rid of fraud and wasted government expenditures is a rounding error. Let’s say you could find $100 billion here or there. You are still a long, long way from a balanced budget. But implicit in the CBO projections is the assumption that we will not have a recession in the next 10 years. Plus, the CBO assumes growth above what we’ve seen in the last year or so. I asked my associate Patrick Watson to go back and look at the last recession and determine the level of revenue lost, and then to assume the same percentage revenue loss for the next recession. We randomly decided that we would hypothesize our next recession to occur in 2018. Whether it happens in 2017 or 2019, the relative numbers are the same. Here’s a chart of what a recession in 2018 would do. Entitlement spending and interest would greatly exceed revenue. The deficit would balloon to $1.3 trillion. And if the recovery occurs along the lines of our last (ongoing) recovery, we will not see deficits below $1 trillion over the following 10 years—unless we reduce spending or raise revenues. The situation is merely hopeless, but not critical. Next week, I’m going to outline some of the policies that I think have the potential to save the US budget. I can guarantee you that some of my proposals will annoy almost everyone, but that is the nature of a compromise—nobody gets everything they want.